Bang & Olufsen has unveiled a new wireless music system with the world's first touch-sensitive wood interface at CES. 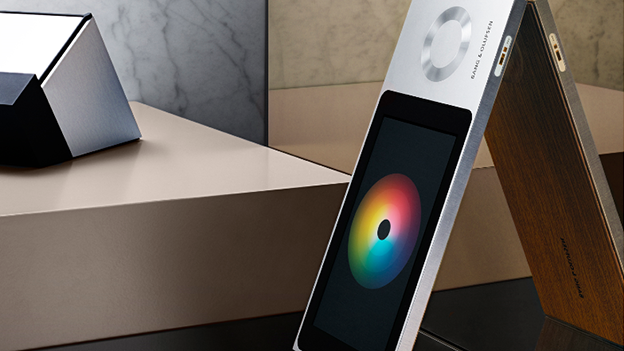 The Bang & Olufsen BeoSound Moment is a wireless speaker controller that features a detachable double sided interface. On one side, there is a touchscreen interface that can be used to access music from Deezer Premium. On the other side is a touch-sensitive oak panel that allows you to control music playback. Aside from the touch-sensitive wood panel, one of the most interesting features found in the new BeoSound Moment is PattenPlay. According to Bang & Olufsen, PatternPlay adapts to your listening patterns and suggest music or radio programmes that fit with the relevant day of the week and time of day. The music presented by PatternPlay can either come from your own catalogue of music, or from the 35 million tracks found on streaming service Deezer. Another feature found on the moment is the MoodWheel. According to Bang & Olufsen, the MoodWheel allows you to quickly express your mood and find music that matches it. The MoodWheel is divided into different colours. Picking blue will select music for when you're feeling down, while tapping the yellow area will select music full of energy. The BeoSound Moment is compatible with Bang & Olufsen's full range of wireless and wired speakers. “As a modern, cloud based music system, BeoSound Moment will offer software updates with new features and improvements,” says Marie Kristine Schmidt vice president of brand, design and marketing at Bang & Olufsen. The BeoSound Moment will be available at the end of this month from Bang & Olufsen stores for £1,795, including 12 months of Deezer Premium+.